Shortcakes, berries and cream are all you need for a fabulous dessert! Nothing indicates that Spring is finally here like the arrival of strawberries! If you haven’t already made this classic all-American dessert yet, now’s your chance! Let’s say you’re invited to a friend’s house for a weekend backyard party… and you want to contribute a dessert to the party but don’t know what to make? Herein lies your salvation. Bring strawberry shortcake! It’s everyone’s favorite! Bring the components with you in separate containers, and assemble just before serving. 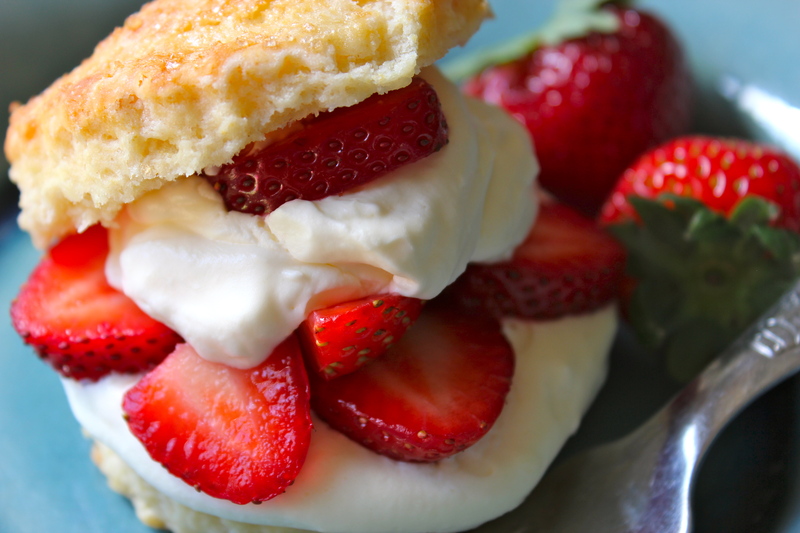 There are only three components to this dessert: strawberries, whipped cream, and lightly sweetened biscuits. Follow our how-to videos to help you along with preparing each component. As always, we’ve created a portfolio of all relevant how-to videos on our Vimeo Channel: http://vimeopro.com/dearmartini/strawberry-shortcake. We hope this will earn its place in your arsenal of go-to dessert recipes! Bake the shortcakes according to recipe and set aside. While the shortcakes are baking, prep the strawberries for macerating and whip the cream. Serve immediately. If you are taking the shortcakes to an event, it’s best to assemble the dessert on site. Macerate the strawberries and whip the cream immediately before serving. Arrange the bottom half of a biscuit on a plate. 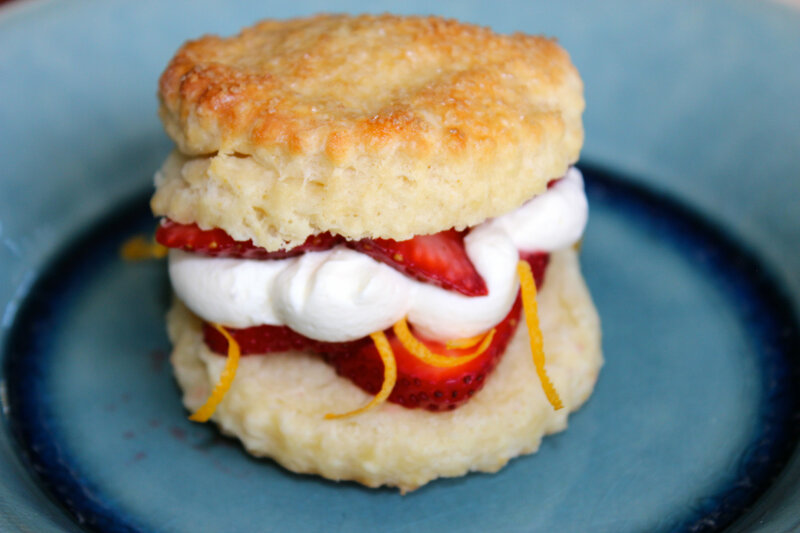 Place a generous spoonful of the macerated strawberries and the resulting syrup on the biscuit. Spoon a generous dollop (or quenelle) of whipped cream over the strawberries. Top with the top half of the biscuit. Repeat with the remaining biscuits. Garnish with either threads of lemon zest or a fanned strawberry. Serve immediately. * in this recipe, the base recipe for the biscuits is derived from our scone recipe. We like to make our own acidulated milk instead of using buttermilk from the store; so if you wish to use buttermilk, substitute ½ cup for the lemon juice and whole milk. Mix the lemon juice and milk together and let it stand in the fridge for as long as it takes to prepare the rest of the recipe. If you are using ½ cup buttermilk for this recipe, eliminate this step. Cube the butter and keep in the freezer until you are ready to use them. In a large bowl, mix the flour, sugar, baking powder and salt with a wooden spoon. Add the butter. Cut the butter into the flour using a pastry blender or break up the butter into the flour by rubbing the butter and flour together between your fingers. Do this very quickly and randomly. You should still have lumps of butter varying from small (pea-sized) to large (blueberry sized). Do not let the butter get soft. If it does, return the bowl to the fridge for a few minutes. Combine the eggs and milk mixture together and add to the flour mixture. Stir gently with a wooden spoon until the dough forms a shaggy, lumpy mass. It’s ok that it’s not smooth or uniformly mixed in. It’s ok to see random lumps of butter still not mixed in. Transfer the dough onto a well-floured surface and gently, with floured hands, pat it down into a rough rectangle shape about 1-inch thick. Use a spatula and pick up one end of the dough and fold it over in half. Pick up the entire dough piece and turn it 45-degrees. Flour your hands and pat it down into another rectangle. Repeat this patting, folding, turning method 4-5 more times. Keep flour dusted underneath the dough as you turn it. For the last pat-down, make sure the rectangle is about 10-12 inches long and 6 inches wide. Transfer the dough to a sheet pan and cover. Refrigerate for at least 15 minutes to firm up the butter. Use a 3 ½ -inch diameter biscuit cutter or round cookie cutter to cut the biscuits. Place the biscuits on a baking sheet lined with parchment paper. Press the scraps together and pat and fold to recombine the dough. DO NOT KNEAD THE DOUGH TOGETHER. Continue cutting out biscuits and reforming the dough until they are all cut. Refrigerate the biscuits for about 30 minutes to firm up the butter. Just before baking, lightly brush the egg wash over the tops of the biscuits and sprinkle the tops with the turbinado sugar. Bake for 20-25 minutes, or until the tops are browned and the insides are fully baked. 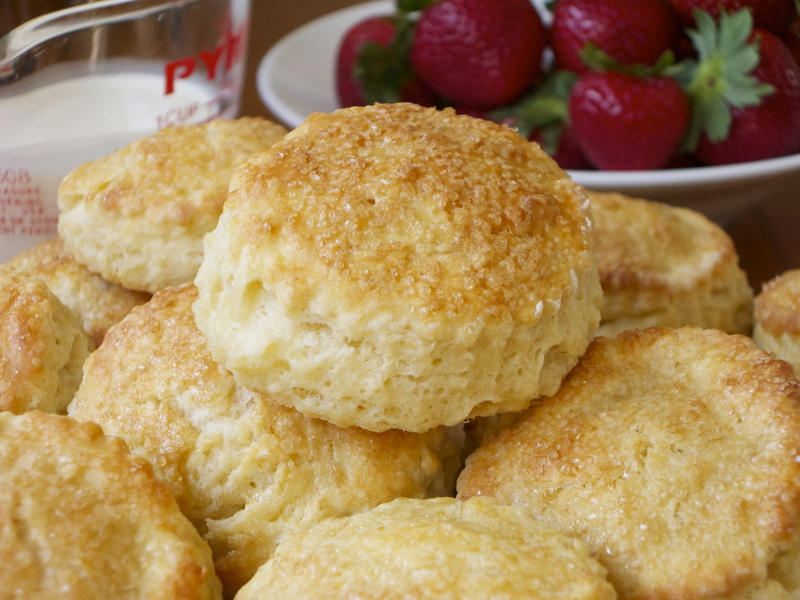 The biscuits will be firm to the touch. Transfer the pans to a wire rack to cool. Macerate the sliced strawberries in a large bowl with 1 tablespoon of sugar. Let them sit for 15 minutes or keep covered in the fridge until ready to use. In our experience, strawberries taste best when they are cool, or at room temperature. We find that the chill from the refrigerator inhibits their flavor. Whip the cream with vanilla extract and powdered sugar. Keep covered in the refrigerator until ready to use. Set all components aside until you are ready to serve. Strawberry Shortcake — the classic all-American summertime dessert! We’re in the last stretch of summer and if you haven’t already made this classic all-American dessert yet, now’s your chance! Let’s say you’re invited to a friend’s house for a weekend backyard barbecue… and you want to contribute a dessert to the party but don’t know what to make? Herein lies your salvation. Bring strawberry shortcake! It’s everyone’s favorite! Bring the components with you in separate containers, and assemble just before serving.